Catering to your total appearance and well body needs. Let Terrace Retreat Salon and Day Spa cater to your total appearance and well body needs. Whether you are visiting us for the first time or regularly experience our full range of beauty services, we look forward to meeting your needs. Take a stress-free "break" in your day and come relax your mind and body and revitalize your spirit. You'll want to surrender to the luxury of the Terrace Retreat Salon & Day Spa, that rare combination of splendor and necessity - a place that restores health and expresses beauty. 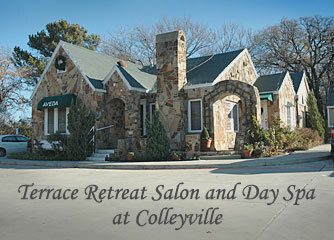 Terrace Retreat Salon offers an extensive line of beauty services. Choose from a variety of a la carte services or packages - from hair, nails, skin care, and tension - relieving body massage to a seaweed body wrap - there's so much more! All salon services are offered in state-of-the-art, attractive treatment rooms. Discover the difference - the Terrace Retreat Difference! These rich experiences, and more, await you at Terrace Retreat Salon and Day Spa.